ClubCoins Needed: 150 Please note that this item is not available on your device. You may add the item to your Wish list and redeem from a compatible device. From the multimillion-copy bestselling author of The 7 Habits of Highly Effective People, hailed as the #1 Most Influential Business Book of the Twentieth Century, The 3rd Alternative introduces a breakthrough approach to conflict resolution and creative problem solving. There are many methods of ';conflict resolution,' but most involve compromise, a low-level accommodation that stops the fight wi… thout breaking through to new and innovative results. The 3rd Alternative introduces a breakthrough approach to conflict resolution and creative problem solving, transcending traditional solutions to conflict by forging a path toward a third option. A third alternative moves beyond your way or my way to a higher and better wayone that allows both parties to emerge from debate or even heated conflict in a far better place than either had envisioned. With the third alternative, nobody has to give up anything, and everyone wins. 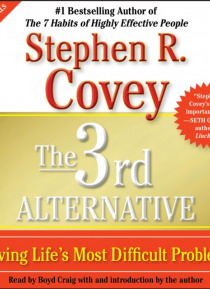 Through key examples and stories from his work as a consultant, Covey demonstrates the power of 3rd Alternative thinking. His wide-ranging examples include a Canadian metropolitan police force that transformed a crime-plagued community; a judge who brought a quick, peaceful end to one of the biggest environmental lawsuits in American history without setting foot in a courtroom; the principal of a high school for children of migrant workers who raised their graduation rate from 30 percent to 90 percent; a handful of little-known people who are quietly finding new ways to bring peace to the Middle East; and many others. These various groups and individuals offer living examples of how to create new and better results instead of escalating conflict, as well as how to build strong relationships based on an attitude of winning together. Beyond conflict and compromise, The 3rd Alternative unveils a radical, creative new way of thinking.